IKEA in the United States: the familiar and unfamiliar "in one bottle"
Date of publication: March 10 2016 . In this article we will look at features IKEA in the United States of America, having a tour of several cities, we will find the general and differences, as well as you will learn about interesting facts and convenient IKEA stores in the USA, unlike, for example, the Russian shopping centers of the company. 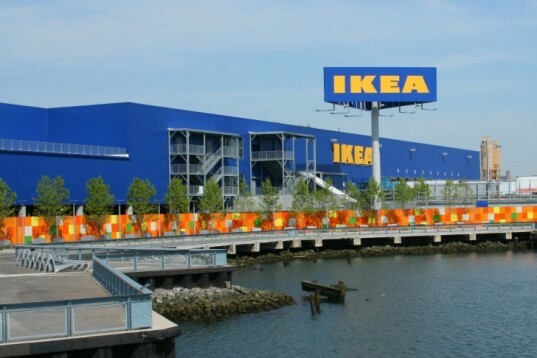 In detail, we look at IKEA stores in Brooklyn and New Jersey, and also mention some of the features of stores in Philadelphia. Shop IKEA New Jersey It equipped with self-checkout, which indicates a high credit of trust to customers. Moreover, it is very beneficial for business owners: the equipment performs all the same functions as the cashier, but is much cheaper. In Brooklyn such option, by the way, no, here the golden rule: "Trust, but verify." In Brooklyn there is a check of trucks with goods and cash checks, which, for example, is not in the shopping center IKEA Philadelphia and New Jersey, as well as in most of the shops around the world. Probably, there were cases in which this innovation followed. However, the cash register machine is able to protect against possible fraud or error on the part of the buyer. Working with it is as simple as possible: we read the barcode from the product with the scanner, then put this product on a special platform with weights. Therefore, to break through the check one product, and put on the platform the other will not work. All scanned items can be seen in the list on the screen. When you scan all your purchases, you can click the payment button, which allows you to pay for goods in cash or by credit card. When paying by card, the system will require you to enter a PIN code or sign a special pen directly on the screen, it depends on the type of your card. If you make a payment in cash, the change can be taken in the tray, which is located just below the screen. As a rule, there are no problems with accepting banknotes in the automatic cash desk, which is sometimes not typical for such payment systems in Russia. At the exit from the store IKEA in Brooklyn You will find a surprising discovery: if you have purchased something large and need delivery, then the U-Haul truck is at your service. His rent will cost 20.95 dollars for the first hour, taking into account insurance with a franchise for 150 dollars. Each subsequent hour is paid at the rate of 9.95 dollars, and one mile of mileage is 0.99 dollars. You do not have to refuel the car, fuel is already included in the price. True, the truck will have to be returned to the previous parking space, close the door with a card, and the payment will come later. Even the function of checking the driver's license is provided, which need to be shown in a special camera in the vending machine. If you do not have the opportunity to rent a truck, for one reason or another, you can order a paid delivery that costs 59 dollars within Brooklyn and 99 dollars to the rest of the area, 149 dollars outside the city, but no further than 100 miles . In addition to the truck U-HaulIn the IKEA store in Brooklyn, you can rent a passenger car Zipcar. Rent is expected hourly, in a taxi, but without driver. Interestingly, in New Jersey, as well as in St. Petersburg, you can not go with a cart to the car. For this purpose, a special zone outside which will not go out, because this area is enclosed by columns that do not allow them to take through the trolley. AT IKEA New Jersey still have secure parking for trucks with purchases, which is more like a cage for dogs. In contrast, New Jersey, in Brooklyn can be reached in a cart to the machine itself, as well as in the shopping center MEGA. Trolley collects a special machine, which is controlled with the remote. It's no secret that individual state tax rates are set in every state in the USA. In New Jersey, prices are lower than in New York, at 5%. In general, IKEA stores around the world are very similar: identical playgrounds (Except for New Jersey, which provides automatic notification of parents that it is time to pick up the child); a cafe with hot dogs and meatballs (by the way, in the US IKEA stores do not sell alcohol, but unlike in Russia); fun layouts, and demo versions of products, and more. Note that most of the American stores built in beautiful places thus in IKEA in the United States you can not only make a purchase, but also to admire the scenery. In New Jersey, you can see the airport runway, and New York - Statue of Liberty and Manhattan, in Philadelphia - the liner "United States". The article was written based on the user of LiveJournal article samsebeskazal.